They say Sunday is the day of rest and having only arrived back from Venice on the Thursday (and going straight back to work for two days on the Friday!) I’m sure you could have forgiven me for taking full advantage of this tradition. However that just doesn’t seem to be the way I roll at the moment! I get incredibly bored if a day off work passes by without plans so for this very reason I found myself on a train to watch Ventforet Kofu take on Albirex Niigata just a few days after arriving back in the country. It wouldn’t be a day at the football without some sort of novelty picture! As usual (when he gets permission from the missus!) 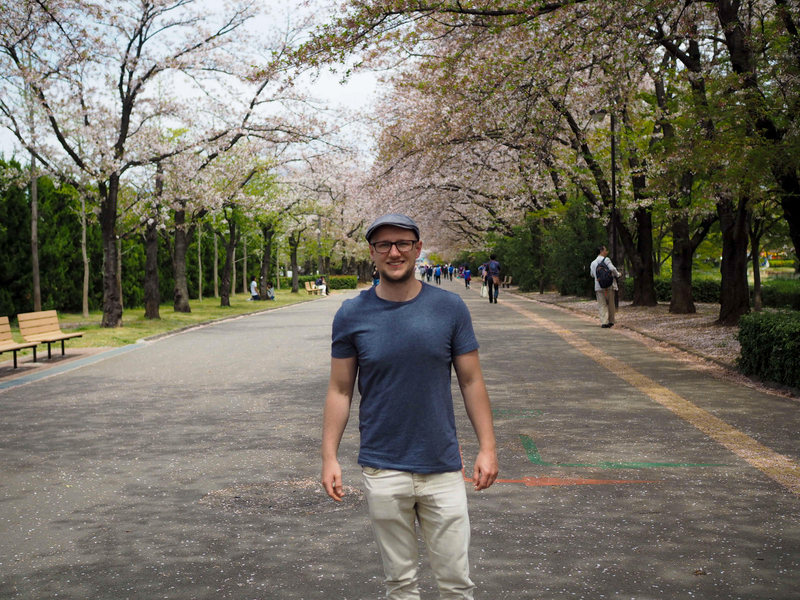 I was accompanied by the Tokyo Fox himself – Glen – although our other usual attendee Neil was sadly absent this time. We met at Takao station at around 9am meant leaving my place in Kichijoji at around 8am. I had something of a shock when Glen told me it was at least another 90 minutes from there to Kofu! I’d assumed the bulk of the journey was already out of the way. Despite the early hour I decided that an hour and a half journey would pass by quicker with a few beers but to my dismay the kiosk at Takao station didn’t have any for sale! I guess a train station primarily used by mountain climbers wouldn’t see much of a demand for alcohol. I reluctantly settled for a water and with the scorching temperatures that were forecast this was probably quite a good thing in hindsight! The journey from then on was very much plain sailing. The scenery really seems to pick up whenever you head out of Tokyo regardless of direction and I wasn’t the only person on the train to take advantage of this and grab a few snaps. I did have a good chuckle at the two other guys who were no younger than 70 at the very least taking photos alongside me. 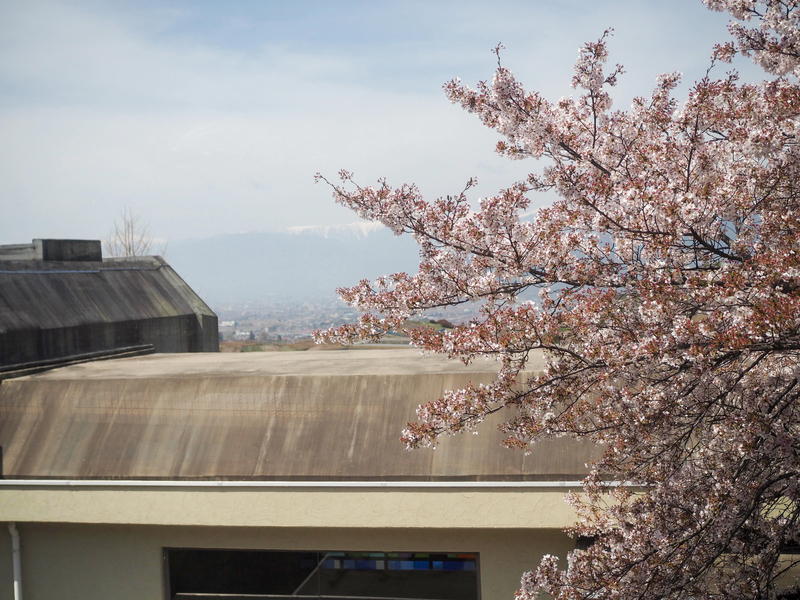 They seemed to be in absolute awe of the cherry blossoms and Mount Fuji and snapped away relentlessly for most of the journey. Now I’ve been in Japan for almost two years and would happily never look at Fuji again after climbing it; I’m not sure why they were taking more pictures of the bloody thing considering they’ve probably seen it thousands of times and taken hundreds of pictures of it over the years! Each to their own I guess. The day was going suspiciously well and that luck continued as we left Kofu station and got onto a bus to the station almost instantly (well, after a quick trip to FamilyMart for food and drink of course!). 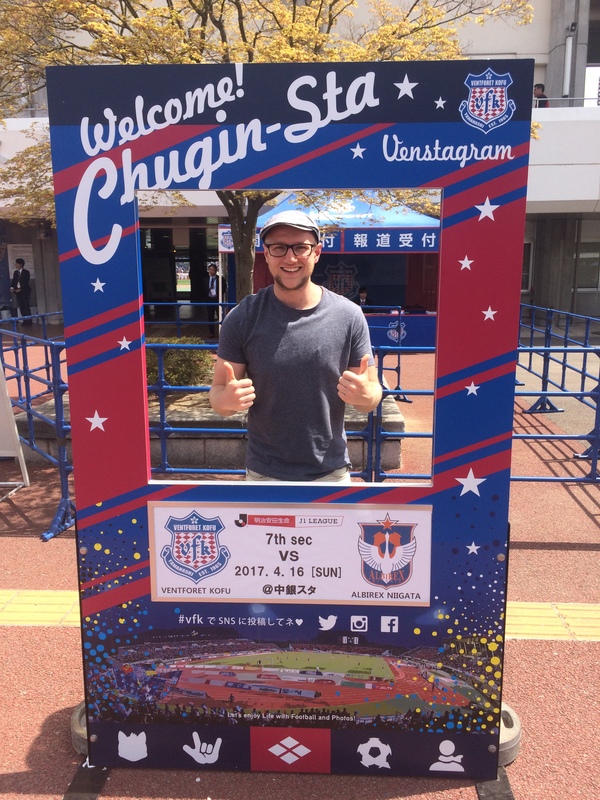 We arrived at the stadium with about two hours to kill before kick off so we had a wander round the area, purchased our tickets (¥2,700 for a side view – not bad at all!) and lounged about in the shade. It’s not Wembley Way, but it’ll do! I’ve not found myself too blown away by most Japanese stadiums as they tend to be either one of those new lifeless domes or a half-decent old ground ruined by a running track. 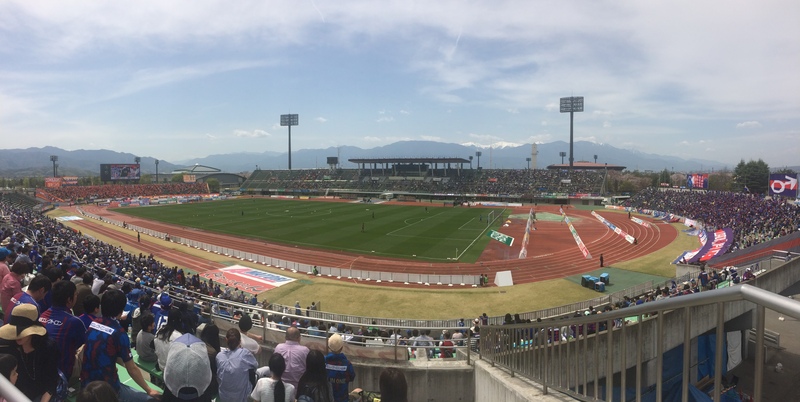 Kofu’s Yamaguchi Chuo Bank Stadium was an exception to this rule though as – despite having a running track – the backdrop of snowy mountains was just incredible. The picture doesn’t do it justice, but this coupled with the cherry blossoms and the park outside the ground meant it really was the most picturesque stadium I’ve ever been to. Almost certainly the best view I’ve ever had at a football match! Despite going into the ground an hour before kick off, we still had to go through the standard rigmarole of searching for empty seats. 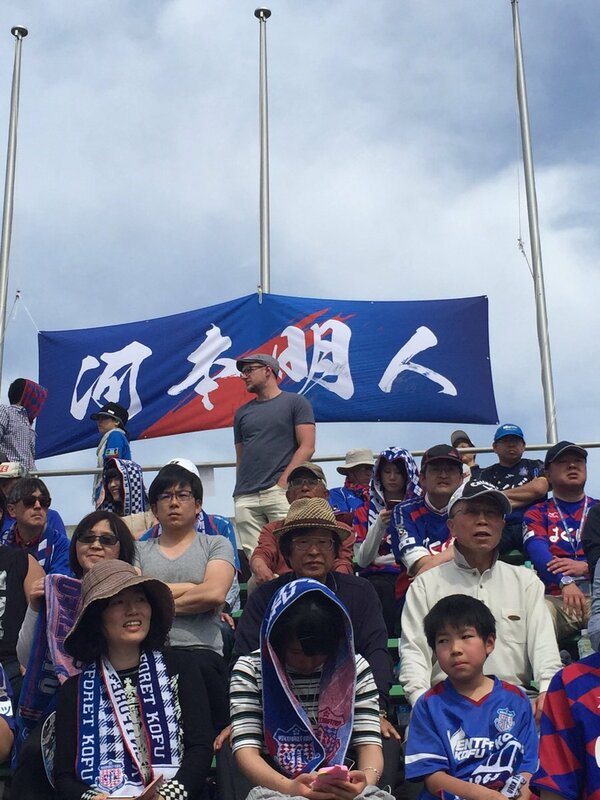 I’ve said it before that German holiday-makers and their beach towels have nothing on Japanese sports fans and Kofu was no exception as people seemed to have turned up hours before kick off and reserved their seats with anything from flags and scarves to strips of masking tape! As usual the game itself took a backseat to the idle chit-chat, childish jokes and flowing beer. The visitors Albirex scored a goal in either half to take a 2-0 victory which was something of a surprise; I base this not on the form table or anything, but purely because the large majority of games I watch in Japan only ever seem to finish 1-0! ‘A sore thumb’ comes to mind! The journey back into the city was just as uneventful as the one to the stadium and we found ourselves back at Kofu station in good time. A little research showed there wasn’t a great deal to do in the city but Glen wasn’t going to let this stop him milking a few blog posts out of it! After a brief wander around the area taking pictures of anything and everything, we headed to a restaurant to try the local cuisine. 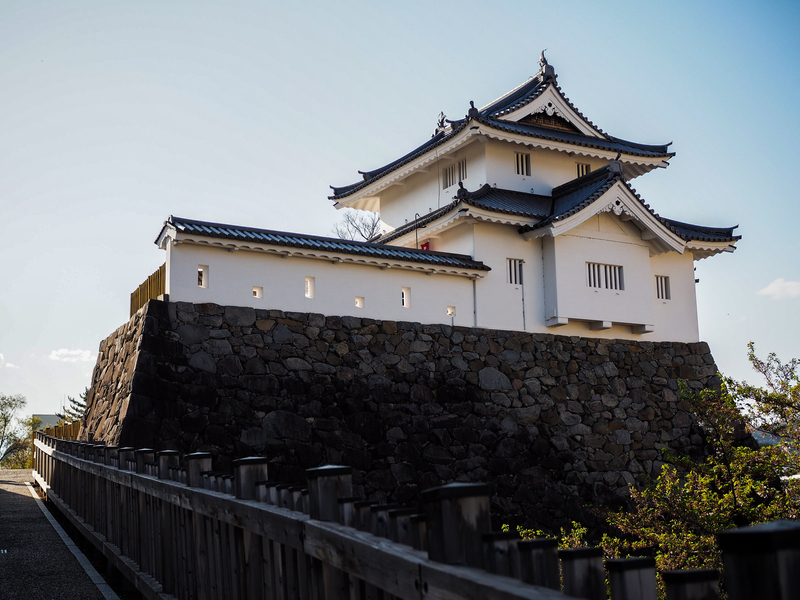 Kofu Castle – not that different from any other Japanese castle really! As was the case in Mito, the local delicacy here was a little off the wall. 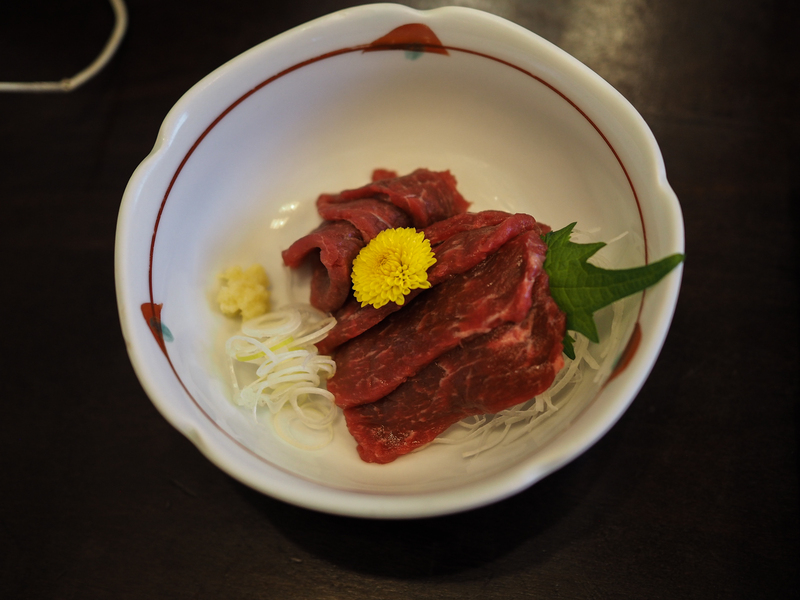 Kofu is known for its ‘basashi’ – raw horse meat to you and I! Now I’ve eaten this before and if you’ve been reading this blog for a while you’ll know that I have very few qualms when it comes to eating! I’ll try anything once and I’m not really too bothered where it comes from. If it tastes good then it’s worth it! One thing I’ve found on my travels around Japan is that every city has ‘very special’ food and that particular food is apparently better than anywhere else in the country. The same was said about soba in Nagano which tasted (to me) exactly the same as every other soba I’ve ever tasted. I can’t claim to have eaten much basashi, but this didn’t taste too different to the small sample size I had to compare it with. Still, it was tasty! 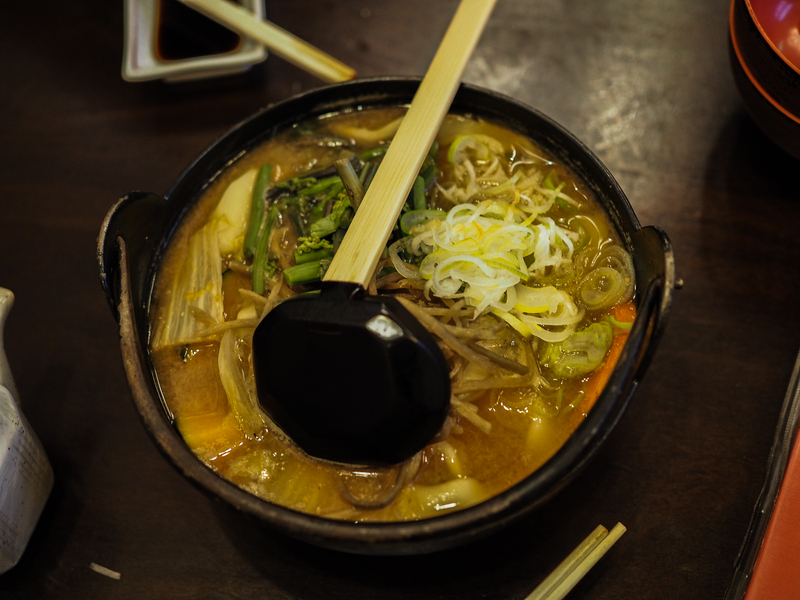 The second dish was ‘hoto’, which was a bit of a soupy stew with vegetables. I’ve got a way with words haven’t I? The picture says it better than I could! This was alright, I’d certainly eat it again but I won’t be rushing back to Kofu for it any time soon! 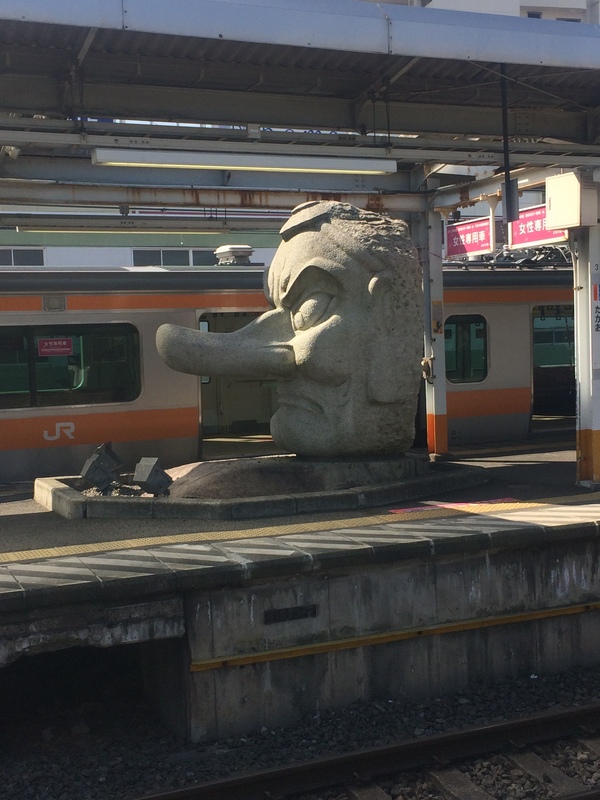 We decided we’d seen enough of Kofu (and eaten enough) so we headed back to the station for our gruelling two and a half hour train journey back to the big city. 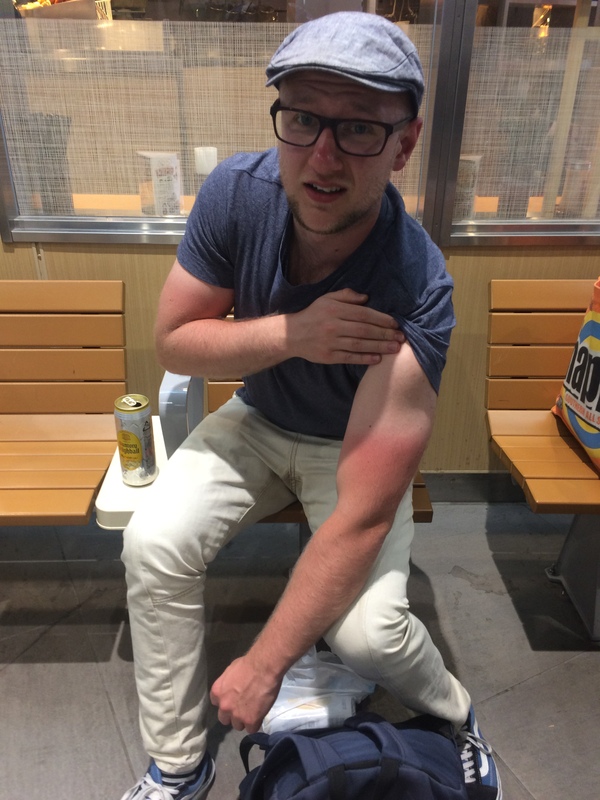 It’d had been a very hot and tiring day, but I hadn’t realised just how hot it had been until we got to the station and noticed I was sporting a rather prominent trucker tan. The journey back was an uneventful one as the sun and alcohol had well and truly taken it out of us so we were fairly subdued. If I didn’t get so bored on the weekend I’d consider a J-League abstinence for a while; I’ve seen two goals in a competitive game for the first time since December – I wouldn’t want to push my luck any further!